How many children do you want to register? Does your child have an Individual Education Plan (IEP) or require special accommodation ? Thank you for letting us know. Our school coordinator will contact you within the next 2 weeks for more information. What is the status of the student? I agree for the photos to be used for classroom purposes (which includes arts and craft work and weekly JROOTS emails to parents), and for publicity purposes both in newsletters and social media. 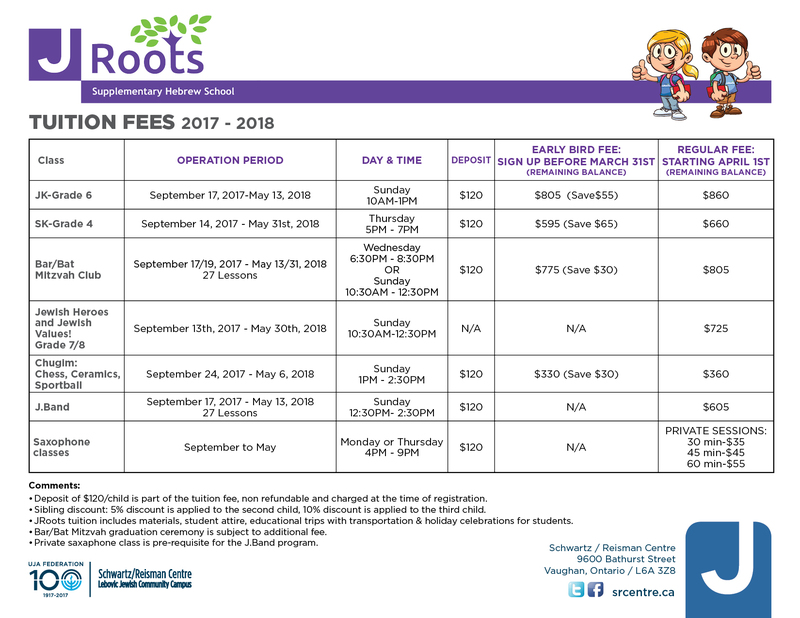 I authorize my child to participate in J.Roots Supplementary Hebrew School out-of-class learning activities. I understand that the travel methods be either school bus or by foot. I authorize my child to participate in Kachol Lavan Supplementary Hebrew School out-of-class learning activities. I understand that the travel methods be either school bus or by foot. I am the parent or legal guardian of the above named minor and have legal authority to execute this informed consent agreement on his/her behalf. I understand that the activities of The Schwartz/Reisman Centre Supplementary Schools include some physical activities including dance, hands on and interactive games and recognize there are inherent risks in this activities and herby approve my child’s participation. I am aware that from time to time parents or staff members of the Schwartz/Reisman Centre or its designees photograph, audiotape, videotape or film in our classrooms. I agree and give permission to The Schwartz/Reisman Centre, associates and affiliates to collect information contained in this application and or provided subsequently for use in contacting participants and or their families. I have read and fully understood the contents of this informed consent agreement. I agree and give permission to The Schwartz/Reisman Centre Supplementary School or its nominees, associates and affiliates to collect information contained in this application and or provided subsequently for use in contacting participants and or their families. I have read and fully understood the contents of this informed consent agreement. I accept the above declaration: I acknowledge and understand that by checking the box below. I am electronically signing the within document, and that by doing so I acknowledge the truth and completeness of the contents thereof. I agree to pay the fees specified in this agreement. Monthly payments will be made on or after the 15th of each month. You authorize The Schwartz/Reisman Centre to charge these dues to your bank account or credit card. You agree to notify us in writing within 10 days of any change to your bank account or credit card account. All registration fees and tuition fees and any charitable donations are fully tax deductible. Tax receipts will be provided by The Schwartz/Reisman Centre accounting department upon full payment. Receipts are issued once a year, usually in February for the previous year. *** If you select EFT only the deposit will be charged to your card. Your registration deposit is part of your tuition fees: it is not an additional fee. A $120/ per child deposit is mandatory and non-refundable before you pay for the yearly tuition. A registration deposit is required only once for the 2019-2020 year. The Supplementary Hebrew School must be notified 4 classes prior to the last class about the cancellation in writing. In the case of a refund, the tuition fee will be based on classes attended plus four classes based on the price at the time of registration. Please re-check all fields before submitting.